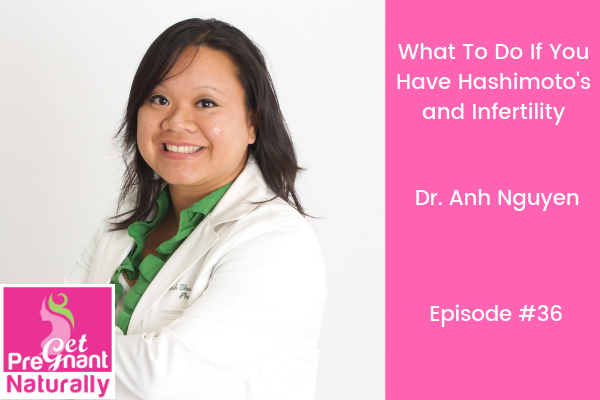 Today I’m welcoming Dr. Anh Nguyen to the podcast! We’re digging into the connection between Hashimoto’s and infertility. Dr. Anh Nguyen is a licensed pharmacist and a functional medicine practitioner specializing in Hashimoto’s and thyroid conditions. She is the host of the popular Food as Medicine with Dr. Anh podcast where she interviews people and practitioners who have healed themselves or others from chronic conditions using simple changes in their food, supplements, and lifestyle. I can’t tell you the number of women that I speak with on a regular basis who are struggling with Hashimoto’s and infertility. It is time to step back and listen to what your body is desperately trying to tell you. While I believe in being proactive – moving ahead to another IUI or IVF before stopping to focus on your preconception health…doesn’t make sense. I want you to prepare your body in the absolute best way for a baby. If you have Hashimoto’s there are very specific steps you need to take to get your body ready to have a baby. Even if you have been told your thyroid is “normal” and you are struggling to conceive – this episode is a MUST listen. Why thyroid health is so important for fertility and why the TSH is not a reliable thyroid marker. What elevated antibodies really mean for thyroid health and fertility. Plus what steps you can take right now. The impact hormonal birth control has on the thyroid and autoimmunity.